Public · Hosted by Tapestri Inc.
Join Tapestri for our annual Human Trafficking Forum. We gather each January, in honor of National Human Trafficking Awareness Month, to share knowledge and build connections among people who currently or aspire to fight against human trafficking. 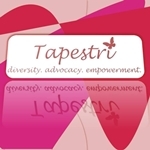 Tapestri's forum is focused on best practices for serving foreign-born survivors of human trafficking. This full-day event includes breakfast, lunch, coffee, and an amazing line up of speakers that we will release soon.